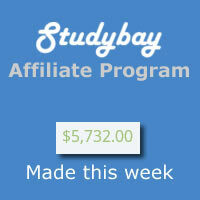 →Studybay Affiliate Program ~ Earn Recurring commissions! Studybay Affiliate Program ~ Earn Recurring commissions! Affiliate Marketing is one of the fast ways to make handsome amount of money online. But one of the biggest challenges has remained how to locate the high converting and massively used product to promote as an affiliate. Today, we are looking at StudyBay Affiliate Program, one of the most rewarding affiliate programs on the Internet in our days. That’s because StudyBay is in an industry where demand for its services is in huge volumes and promoting it as affiliate is a sure way to make some money. Authors, on the other hand, can earn money, get a great experience and real reviews. This is where passive income comes in. For every of your referrals that orders more than once, you are paid 15% on every purchase. The good thing about StudyBay is that they pay you up to 5% from the profit your affiliates make. Being a Two Tier affiliate program, you can help them recruit more affiliates and still make more money. Now this is like nothing else on the Internet. All you need here is a minimum of $10 and your commissions will be paid any time. You don't have to wait 45 or 60 days to cash out. Cash out your earnings through Paypal or Payoneer. Here are 3 more reasons to promote StudyBay! 64% CR (Conversion Rate) for paid and fulfilled orders. One of the things that get me annoyed with some affiliate programs is when I'm not helped with materials that can facilitate promotion. Generally, most Affiliate Marketing platforms provide banners, email swipes and some PPC keywords. There are many different designs you can simply copy and paste on your web pages and boost your earnings. Are Affiliates really Making Money here? Now, joining the StudyBay affiliate program is free. After having seen how much you stand to to earn, I think it's time to create your free account. Sign Up! Free to join! While you are signing up, please drop a comment below and let me know what you think about StudyBay. Please share this post on social media if you like it. This is one of the great Affiliate program I’ve seen here, I am currently signing up as at the time of writing this comment. I will be taking a look at this in time. You are always providing great information for us to look at. I still have a few things you have recommended that I haven’t taken action on yet but plan to. I know you are really are being kept down by what we discussed on FB. But as soon as you get some time, try out some of these stuffs. Can I promote it using EMD (Exact Match Domain) site? I want to promote it using SEO. Enstine Muki recently posted…Why I Bought Thrive Content Builder ~ Why you too should buy now! Looks like a great affiliate product. One question, is it OK to use PPC to drive traffic to their programme? 2 tier seems interesting. Certainly worth looking into. I think yes but I’ll still recommend you get in touch with the tech guys on the site so they can properly answer your questions. Having worked with an academic assisting agency in the past, I can tell you authoritatively that the demand for academic services is huge – especially during the ‘peak periods’. I’ve already hoped into the affiliate program and I know it’ll be a matter of a few days before I see a nice little number with the $ preceding it. I appreciate you for bringing this offer where my radar can pick it up. Hahaha I’m sure there will be a six figure after the dollar sign brother. Thank you so much for bringing this to our notice, as a school teacher that my wife is, I know she will be of great help to me in making something with this affiliate program. Like Terungwa, “the demand for academic services is huge – especially during the ‘peak periods’. Once again, thank you for letting this out! She might even signup as a writer and make some cool money. How about that? You are always providing great information for us to look at. I still have a few things you have recommended that I haven’t taken action on yet but plan to. Well, first, you’ve piqued my curiosity about Thrive Content Builder. These are the same folks as Thrive themes, correct? Your visuals in this post are excellent, so I’ll be checking that out. Second, StudyBay sounds awesome — that sounds like something I could definitely promote. Right up my alley. I feel like every time I visit your blog, I discover some amazing new tool or resource that I never even knew existed. Hats off to you, man. You’re one of the few bloggers I know who is consistently innovating. You should be proud of that. 2 – As content producer. so take a closer look and you’ll certainly come up with something. I definitely would check this out and share it with my friends. They have so much promotions and I see that they look affiliate friendly. I never heard about this affiliate program regarding education assignments, some of my friends are running education websites in India, I think they too don’t know about this program. I will refer this program to them which can allow them to earn little bit more money from their websites, just landed on their website it is quite impressive. Thanks for sharing information about this program. What’s a promo code? I tried to sign up but was asked for a promo code. I’ve tried a lot of sites to earn through affiliation but all my efforts ended to smoke. I’ve been just messing around I’d say rather. I’m gonna try your tactics and see if things could go my way. A great post indeed.studybay affiliate program is one of the best affiliate programs which is very easy to understand and a popular way to earn. Your explanation is understandable to every reader.